Founded in 2012 by Snodgrass, Debray, and Zhang, Dataware Ventures now has nine employees. They have been developing a working prototype of their technology, funded by the investment to date of over $1.5M. A patent application for the technology was submitted in December 2012. Field Specialization is Dataware's new technology for dynamic code optimization. The primary objective of field specialization is to increase the performance of an application without requiring any major changes to that application's source code. Field specialization eliminates overheads arising from overly-general code that is unnecessary for particular inputs, resulting in code that is significantly smaller and faster. SenesTech believes its technology is the first of its kind in the world to be delivered orally. They have developed and patented species-specific protocols for animal population control by targeting the ability to reproduce. For example, the active ingredients in their formulations chemically accelerate the depletion of eggs in female rats and cause testicular disruption in male rats. After ingesting the prescribed dose of theirbait treatment, rats become infertile. The protocol has been refined and optimized to achieve follicle depletion and testis disruption without causing systemic toxicity or adverse side effects. Studies indicate that when used as directed the formulation is environmentally neutral, and will not affect the food chain. A winner of the 2015 Tibbets Award, they have received Phase I funding from the NIH, followed by $1.1M in subsequent funding for the pilot program in NYC. They are currently gearing up for the process of EPA registration, after which it will be available for commercial sale. Meanwhile, recent tests ranging from the New York Subway, the neighborhoods of Metropolitan Boston, and the rice fields in Southeast Asia have yielded promising results. Once the EPA registration is complete, the path to commercialization will be accelerated by strategic partnerships with a major manufacturer, and a leading pest control service provider who is actively seeking an alternative to traditional pest management methods. Hydronalix is an engineering and design firm that develops high speed unattended devices for littoral and brown water operations. Headquartered out of Sahuarita, AZ in 2009 by Anthony Mulligan, the company has grown to a permanent staff of 15 employees and now has 16,000 feet of production, office, and engineering space. Hydronalix was recently named by the US Small Business Administration as a 2015 Tibbetts Award recipient for EMILY (Emergency Integrated Lifesaving Lanyard). EMILY is a 4-ft long remote controlled buoy can cruise through rip-currents and swift water at speeds up to 22 mph to reach distressed swimmers faster than human lifeguards. SBIR seed funded advanced power systems, navigation, and composite structure systems which integral and key to the success of the companies robotic boat systems. The SBIR technology and program funding has enabled a small desert based rural company to succeed with an international product line constituting more than 50% of its sales revenues. Hydronalix has received a Phase I and II from the Navy and several Phase IIIs from NOAA, Navy, and DARPA. Their primary product, EMILY, has been put to use in the US by first responder Fire Departments as well as tsunami and storm flood rescue response needs in Indonesia, Mongolia, South Korea, Japan, and numerous other countries. The SBIR program has been an instrumental and vital tool for the founders to leverage multiple programs along with their own capital to build a rural based high technology company. Credibility of the SBIR program was also of great assistance in securing Phase III funding and the valuable recognition and support of other federal agencies such as the U.S. Department of Commerce who has been a significant help in assisting the companies export growth. 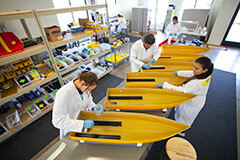 The Company has also leveraged state level assistance from the Arizona Commerce Authority with their SBIR program outreach activities and a recently completed RevAZ micro-grant to develop advanced computer modeling and CNC precision tooling for volume manufacturing of its high performance composite boat hulls and decks. The successful grant program produced two new advanced EMILY systems which have completed sea trials and this effort is now transitioning to the next generation export product. Materials & Electrochemical Research (MER) Corp.
Physics, Materials & Applied Math Research, L.L.C. IGF::OT::IGF SBIR Topic 85 To support the development of target specific molecular imaging agents in combination with existing imaging modalities to detect high risk atherosclerotic plaque. Arizona Magnetic Resonance Research, Inc. Direct Digital Secondary Electron Signal Acquisition Probe for Scanning Electron Microscope.